This is a fun and easy Halloween craft that can be done by kids or adults who want to hand out a special cache of candy for Halloween. Although the photo shows the candy corn heaped directly in the clay pot, I would advise placing it in a plastic bag, or adding a plastic lining to the pot, before adding the candy. Decide whether you want to paint your clay pot with a white rim or a yellow one. 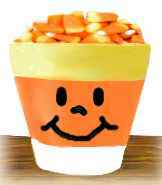 I’ve seen these candy corn pots done either way, so it depends on which you prefer. Paint the rim in the color you have chosen, making sure to dab the paint brush all around the top of the rim and to run it along the slight underside lip of the rim. Let the paint dry to touch (it shouldn’t take long), then paint the centre part of the pot in orange paint. Let this dry too. Finally, paint the end of the pot, and the bottom, in the third color (either yellow or white). Set the clay pot upside down, on its rim, and let dry. Practice drawing a black jack o’lantern face on a piece of paper. When you have decided on the facial details, add these features to the clay pot with black permanent marker, or with a fine detail paint brush and black paint. Simple features usually work well. When the painted pot is dry, add a bag of candy corn. Wrapping the pot of candy in orange cellophane or tulle, then fastening with black curling ribbon, is a nice touch for Halloween gift-giving.